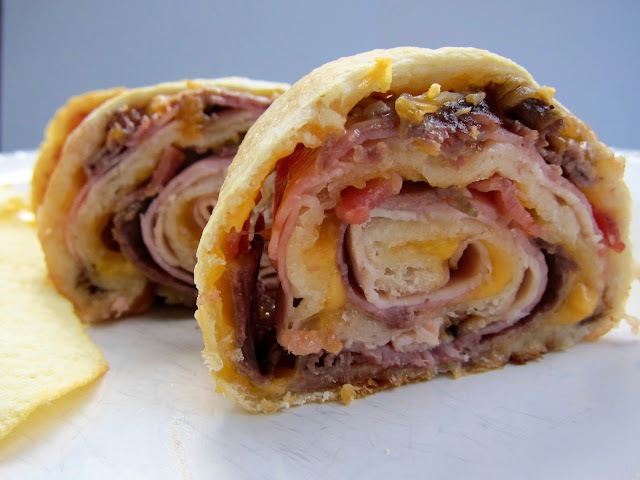 Baked Club Pinwheels - turkey, ham, roast beef, bacon and cheese baked in refrigerated french bread dough. Super easy! Great for lunch, dinner or football parties! It's Football Friday! SEC Football is one week away!! The first college game is next Thursday. Are you ready? I am ready for some football and some great tailgating!! This sandwich is perfect for a crowd. It is easy to grab and eat on the go. You don't need any special utensils or even a plate - which is good at a tailgate. The less you have to tote around the better! You can serve this with some honey mustard, ranch or BBQ if you want a little something extra. Chicken Legs & I tested this recipe out for lunch and it was a huge hit. We had enough leftover for lunch the next day and it was just a good. I have a feeling we will be making this again soon. Heat oven to 350°F. Spray cookie sheet with nonstick cooking spray. Unroll dough. Sprinkle cheese over dough. Top with turkey, ham, roast beef and bacon. Starting with long side, roll up dough; press edges to seal. Make 3 to 4 slits in top of loaf. Place on sprayed cookie sheet. Bake for 23 to 28 minutes or until golden brown. Cool 5 minutes. Cut into 1-inch diagonal slices. Stephanie, I love this sandwich! Can you believe it's football season already? Doesn't seem like it since it's 100 degrees today here in Denver. Goodness! Those look delicious and perfect for game time. Love these pinwheel snacks. I'm ready for some cooler temps that's for sure, but looks like that'll be awhile. Stormy weekend ahead, but at least it might help to cool things down for a couple days. Not a big football fan, but this sandwich looks delish! This would be awesome if you made it in a portable grill onsite at the tailgate. People would be impressed! Wow, looks really, really good. My kids would fall for this! I'm in - this looks sinfully good. Don't watch football, but that snack looks great! I mentioned your recipe on my blog today: www.pennynewton.blogspot.com We had the sandwich this week and it was a hit with everyone. I liked how it was filling and hot without being labor intensive. I can't wait to make these! Great post! Such a wonderful eycatcher! These pinwheels look amazing! @sbj95u, i have not tried these sandwiches but i have used the Pillsbury crusty french loaf with my dinners and i was kind of scratching my head on this one because i don't recall them being made with a seam to unroll. Maybe I'm just not remembering correctly but i was wondering how well they would unroll and if it would be easy to do. The sandwiches look awesome and i definitely want to try them! 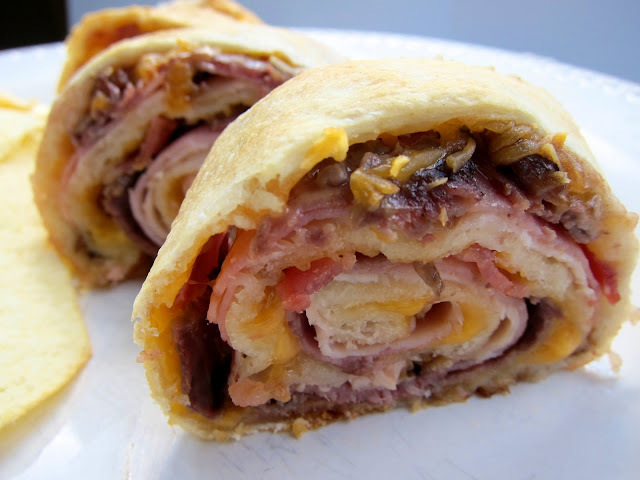 This sandwich sounds delicious--thanks for sharing the recipe! I made these last night, and was very disappointed as the outside bread was overly done, but the inside of the roll was still literally dough. Any suggestions? I didn't have any trouble unrolling the dough. But, at 350 for 35 minutes, the center was still raw dough. The flavor was really good, as well as the concept. I am thinking maybe prepare the dough like a pizza pocket or calzone next time. Then the dough will actually cook in the center? Or maybe lower the oven temp to 300 and bake an hour? Any ideas? 'Cause the flavor is killer good! Mom in Bliss - You could cover the dough with foil once it gets brown on the outside. I've never had any issues with it not cooking. 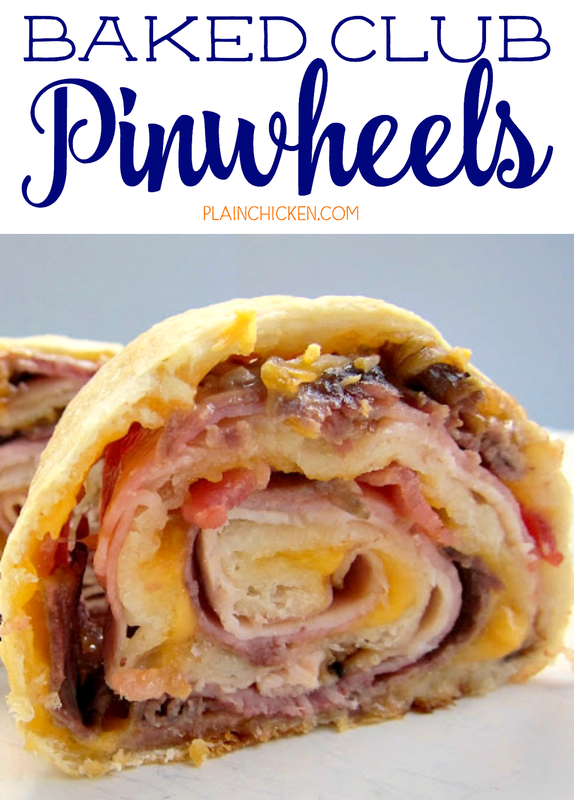 These pinwheel sandwiches were amazing! I followed the recipe exactly and it turned out perfect, I baked for 25 minutes at 350 and it was golden brown with a cooked but delicious soft center. I've never used the Pillsbury french loaf before and understand some who are confused on the seam, I looked back up at the directions again to check for further info. There is a clear seam in the dough and if not just make one! My fiance felt it was slightly difficult to pull apart too, until I walked over and just pulled it apart. You don't have to be super gentle with the dough! We pulled it apart and flattened it out and it cooked wonderfully! If your dough is sticky, get out some flour!